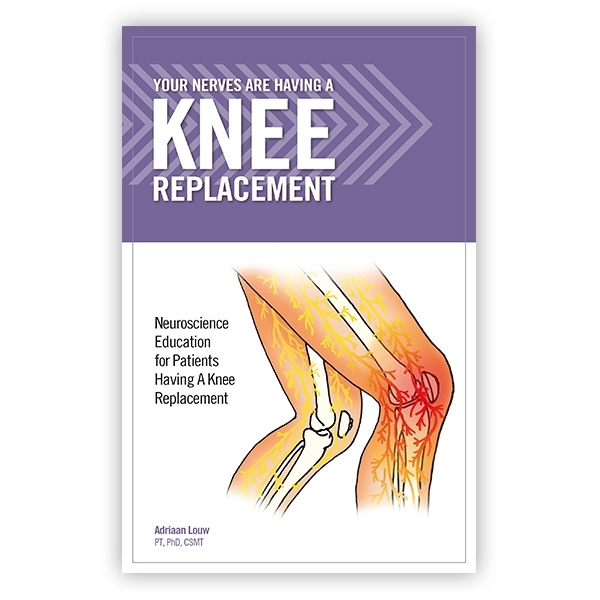 Learn how to calm sensitive nerves before and after a knee replacement in this book from physical therapist Adriaan Louw. This book, written by physical therapist and clinical neuroscience researcher Adriaan Louw, reveals how your body and its nervous system react before and after knee replacement. It is written in an easy-to-read format with illustrations for better understanding. It shows how nerves experience the procedure, explains why pain is normal and helps you learn to calm extra-sensitive nerves and reduce pain. Illustrated. Softcover; 32 pages. Non-returnable. All TKR patients should read this! This is another great resource from ISPI. The user-friendly colorful booklet helps patients know what to expect as they head in for a total knee replacement. The section on "Your Hospital Experience, Your Surgery and Your Nerves" is particularly helpful as patients contemplate their upcoming procedure. Complex principles of pain neuroscience are presented in an easy-to-understand format, with a logical flow and clear writing style. I shared this booklet with a physician in my area, and she offered enthusiastic praise, saying "All TKR patients should read this!" I couldn&apos;t agree more.